Electric linear drives are replacing conventional pneumatic cylinders in more and more applications. The reasons include poor efficiency, high costs for commissioning, reconfiguration, service, and maintenance, and the limited control capabilities of pneumatic systems. LinMot has performed a total cost comparison demonstrates that electric linear drives, at current prices for components and electricity, pay for themselves within a few months even for simple point-to-point motions with two end positions. In their case study the annual energy costs for linear motor solution was 96 Euros whereas the annual energy costs for a pneumatic cylinder is about 3000 Euros. This is a significant reduction in carbon footprint in addition to cost savings. In addition, they provide greater flexibility in the design of production processes and production monitoring systems. This post is an extract from the case study published by LinMot. The key assumptions, workings and results are reproduced here but for the full story you may like to visit LinMot’s website. Pneumatic drives are widely used and the initial purchase cost is cheaper than that of a linear motor. There are many reasons for their widespread use including robustness with respect to external influences (e.g., temperature variations and dust) and a high resistance to overload. They are also simple to operate and do not require holding current when installed in a vertical orientation. Compressed air is also used for transport and cleaning tasks in many shop floor and industrial environments, so that compressor systems need to be provided in any case. Wikipedia states that in industry, compressed air is so widely used that it is often regarded as the fourth utility, after electricity, natural gas and water. However compressed air, is more expensive than these other forms of energy as compressors can convert only a small portion of the input energy into useful power. The great majority is dissipated as heat loss. The total cost calculation (TCO, Total Cost of Ownership) of a compressor shows that 10% of total costs are spent on procurement, 10% or so for maintenance of the system while the energy costs are typically 70 to 80% of the total costs over the service life of the compressor. Many companies are trying to reduce the use of compressed air in their factories to reduce operating costs and CO2 emissions. For linear motions in many applications, the very efficient, all-purpose electric linear motor in tubular form is a good substitute for pneumatic cylinders. 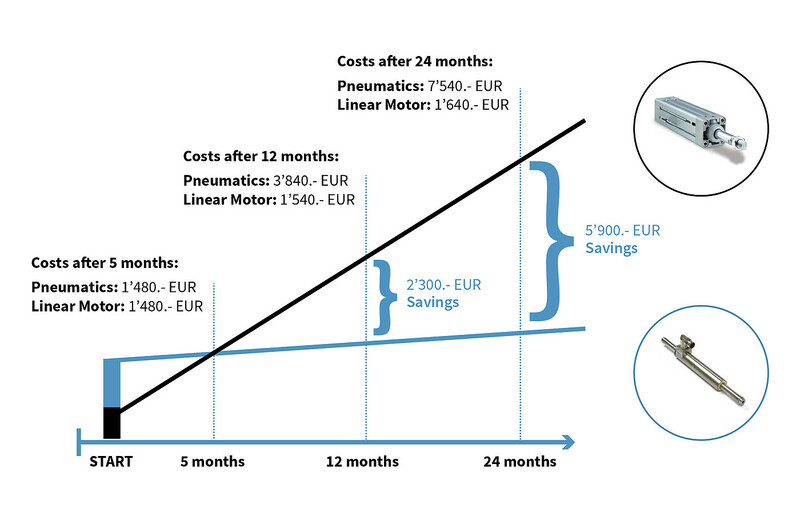 Electric drives are more expensive to buy than simple pneumatic cylinders, but an analysis of the total costs over their service life shows that industrial linear motors from LinMot can pay for themselves within a few months or even weeks, even in simple point-to-point motions between two positions. 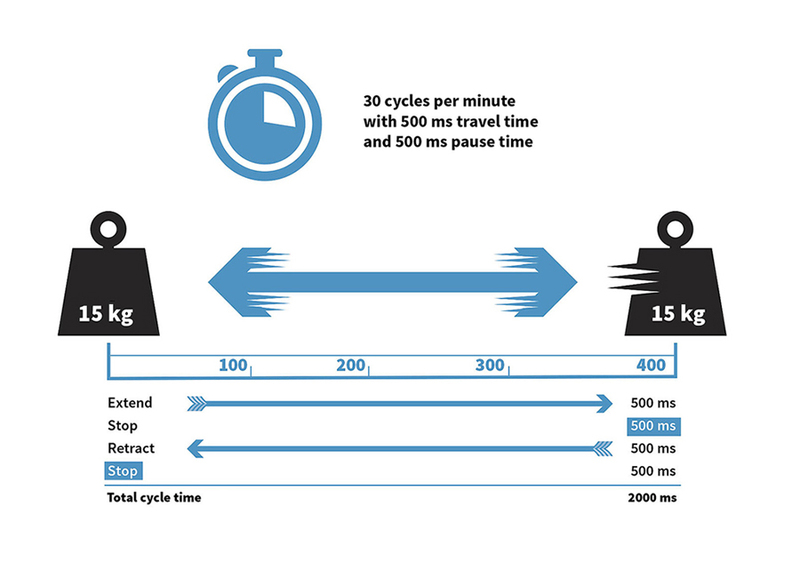 This case study calculates the total costs of a pneumatic cylinder and a linear motor for an application with a horizontal point-to-point stroke of 400 mm and 15 kg of mass in motion, operating at 30 cycles per minutes and 50% duty cycle (= 2,000 ms cycle time). The required positioning time of 500 ms for this task above is achieved with an acceleration of 10 m/s² and a travel speed of 1 m/s. The acceleration time, during which the linear motor does useful work, is then 100 ms. This means that the effective power draw takes place during just one-fifth of the positioning time. When stopped and when traveling at a constant speed, the motor does not draw any power beyond that needed to overcome friction. The kinetic energy incurred during braking is converted to electrical energy in the motor (via the generator effect) and stored in the intermediate capacitors of the servo controller, where it can be used for the next cycle. This application can be implemented using a LinMot linear motor, size P01-48x240F in combination with a LinMot servo controller, model E1100-XC/B1100-XC, with a continuous power draw of less than 100 W.
Assuming 8,000 operating hours per year (three-shift operations) and an electricity price of 0.12 EUR/kWh (price for large industrial consumers, including taxes, per EUROSTAT) the total annual energy cost is 96 Euro. If a load mass of 15 kg is transported pneumatically at a (maximum) speed of 1 m/s, as required by the application example, an analysis of the appropriate characteristic curves for designing pneumatic cylinders from a famous manufacturer indicates that a pneumatic cylinder with a 50 mm piston diameter must be used. In contrast to the linear motor, the energy (compressed air) must be fed in throughout the entire motion. The kinetic energy from braking must also be absorbed by shock absorbers, and cannot be stored intermediately for the next motion. According to its data sheet, the selected cylinder consumes 0.02529 dm³ of air at 6 bar for each millimeter of travel in a double stroke. For a stroke of 400 mm, this results in consumption of 10.37 dm³ per cycle. At 30 cycles per minute, the pneumatic cylinder thus requires a total of 150,000 Nm³ of compressed air per year for continuous operation (8,000 h/year). Considering pressure drop, reduction, and leakage losses on the order of 25%, the compressor must compress and feed a total of about 190,000 Nm³ of air into the pipeline. A normal compressor (750 kW motor, 7,500 Nm³/h air capacity) can use 0.130 kWh of electrical energy to compress 1 Nm³/h to 6 bar, including start-up and run-on losses and compressed air handling. The total annual energy cost is thus about 3,000 Euro (0.12 Euro/kWh x 0.130kWh/m³ x 190,000 m³), or more than 30 times that of the electric equivalent. At a higher cycle count, this ratio would be even worse for the pneumatic cylinder. In addition to pure energy costs, the investment and maintenance costs must also be included in a total cost calculation. Tests have shown that altogether they make up about 20% of total operating costs. In the example shown here, therefore, about 750 Euro must be spent on this each year, so the total operating costs add up to 3,750. Manufacturers of pneumatic solutions rate the total costs (after energy efficiency measures) to be 0.025 Euro per standard cubic meter of compressed air. For our example, this would result in total annual operating costs of 3,750 Euro for the amount of 150.000 Nm³ of compressed air required for one cylinder, which supports the above calculation example. A linear drive, including all required components (cables, inverter, etc. ), in contrast, does cost more than a pneumatic drive (including valves, tubing, etc.). The significantly lower energy costs, however, mean that the electric drive pays for itself in less than half a year. After that point the savings are significant. The energy costs in our example exceed the investment costs for the pneumatic cylinder after just three weeks. Analysis of the investment and energy costs in this application example shows that the savings from the use of an industrial linear motor, compared to the use of a pneumatic cylinder, are 2,300 EUR and 5,900 EUR at 12 and 24 months of service respectively. CO2 emissions can be drastically reduced by switching to an electric linear drive providing another huge benefit. The energy of 24,000 kWh, which is additionally required by the pneumatic cylinder in this sample calculation, results in an annual output of 12,000 kg CO2. In addition to the lower energy requirements, the electric variant has the advantage of greater flexibility in the design of production sequences and monitoring systems. Motion sequences in electric linear drives can be significantly more dynamic and have higher repeatability. The motion profile can be programmed freely, so that even complex motion sequences can be implemented quickly without a problem. They can also be adapted to new requirements, even during operation. Linear drives are significantly quieter and more durable. They are not sensitive to changes in load and can be started and stopped smoothly. Analysis of the data produced in the inverter also allows various process variables to be monitored without additional sensors, which can also be used for remote diagnostics on the system. Not least, fewer individual components are required, and they can be serviced and replaced much more easily than those used for pneumatics. This is reflected in lower costs for installation, maintenance, and logistics. The savings will vary by application (eg sizing of the cylinder to achieve the required speed and load.) Please contact us for an assessment of any potential energy savings that can be realised in your applications or take a look at our website to learn more about LinMot’s range of linear motors.